I've been in love with my Q for over a year now, and am ready to make the leap to the M10. I shoot mostly street and some candid/portrait but no in studio work. I love the lens on the Q....so my initial thoughts were a 28mm and a 50mm.... Like many, I came from a Canon 5D system, went to the Fuji system (owned pretty much every lens fuji made), then discovered the Q....now I'm drinking the cool-aid like it's the last drink I'll ever consume! For those of you Leica lens veterans, do you have any advice for me? lux or cron? anything to look out for? I'm not opposed to buying used. My plan is to sell or trade my Q for at least one of the lenses. any advice would be greatly appreciated! Three or four lenses on a long trip? Hi, this is my first post. I would appreciate some advice: I'm about to leave for almost a month, going to Bolivia for a leisure trip. I won't be alone, so it's not a trip focusing on photography, but I will definitely use my camera as much as possible. I have a passion for street and documentary style, a little portrait, environmental and not, but I definitely don't disdain landscape! I use a M240: first of all, I'm a 50mm man - that will be the main lens for me. I'm still trying to decide which between the Nokton 50mm 1.2 or the Planar ZM 50mm f2 - lightness or speed? I might go for speed, that Nokton is not that big at all! And a pleasure to use. The other lens I already decided about is the Biogon 21mm f2 ZM, great wide angle; that will definitely be in my bag. Two doubts: 90mm Tele-Elmarit thin or 135mm Tele-Elmar? if I go light, will I miss the reach? I really enjoy shooting both, and both don't see use too often. But I don't mind a little more weight if necessary. Second doubt: should I take my 35mm? I have a wonderful Biogon 35mm f2 ZM but I fear it would see almost no use...although I think i interiors it might be more useful than the 50mm when shooting people! What are your thoughts? Thanks in advance!! 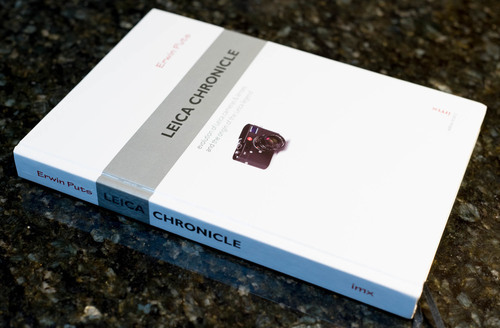 Erwin’s classic hardcover book documents Leica’s history, cameras and lenses from the very beginning up to publication in 2012. A ‘must have’ for any serious Leica aficionado. Book is in excellent used condition. Like new, with very minor indentations on a couple corners (see photos) - it came that way when I bought it new. Rare chance to own this rare volume. Price includes shipping to US addresses. Other addresses, please inquire for shipping cost. Payment via PayPal or wire. I'm in the process of considering ONE of three lenses, all Voightlander (This is more about focal length vs the brand): - 35mm/1.7 Ultron - 50mm/1.5 Nokton - 40mm/1.2 Nokton If you had to choose only one of these which would it be? I already have a 21 CV, 35 Cron ASPH, 50 Cron, 85 Zeiss, 135 Elmar. However I use the 35mm almost all the time. I like the versatility of a 35mm and I hate changing lenses while on the field. Lately, I enjoyed shooting landscape, and I'm thinking of getting a wider lens than 35mm. Main question: Is it practical to have a 28mm despite already having a 35mm? Subquestion: Given my lens line up, I'm considering the 28mm Elmarit ASPH 2.8 or should I get the CV 15mm heliar III? Hi guys, I'm interested in acquiring a 90mm Elmarit-M for the M10. I will be primarily shooting handheld. I was wondering if others had found that heavier chrome-brass versions of telephoto lenses helped reduce motion blur in their images, or did it have the opposite (or negligible) effect? Any insights into the use of telephoto lenses (not necessarily 90mm) would be greatly appreciated. Thanks in advance! After finally getting my M10 delivered to me last November, I was chomping at the bit to use my old lenses that I used to shoot with my M6's some 10 years or more ago. They are all older lenses (late 70's to mid 90's) in 28mm, 35mm, two 50mm's, 90mm, and 135mm and all relatively fast lenses (mostly summicrons with a summarit here and there) but not one of them is aspherical. I loved these lenses while shooting film and still love them on the M10, but it is a ROYAL pain to have to mash buttons up and down and in and out of menus to set the M10 to the right lens designation every time I switch lenses and to be perfectly honest, I haven't noticed a difference in the images. I tried ordering new bayonets that were "codeable" on ebay and turns out the screw patterns weren't the same. And at this point, I'm wondering if I should bother at all? Is there really a difference in a coded vs non-coded lens of this vintage besides getting exif data out of the shot? I've seen the magenta color shift in some of the images posted here and elsewhere, but damn if I can find it in my shots. So... are these lenses too old to code? Just the wider ones? Do I even care? I bought my SL with a Leica S and Novoflex Canon EF adapters to complement the lenses otherwise used on my S2 and RED cameras. I am looking to put together a range of the best M and R lenses, from wide angle such as the Super-Elmarit-R 15mm f/2.8 ASPH, to medium telephoto such as the APO-Telyt-R 280mm f/4. I am looking for recommendations based on first hand experience. I recently purchased an 240 M-P and have been very happy with this camera for RF shooting with my Leica M lenses. I have many Minolta and Sony lenses that I use on a Sony A99 SLR, and was going to sell some of it because most of my shooting over the past few years has been with RF gear, mostly the Leica M5 for film and the M8 for digital. But I would like to explore the use of some of the better A-mount lenses, including a Minolta 200 2.8 AP0 lens on my M 240 with an adapter for this mount. My questions are, has anyone in the forum used the Novaflex adapter with Minolta or Sony A-mount lenses on the M240 or SL? And before I invest in some longer range Leica R lens options, do you feel the image quality with Minolta glass on Leica cameras is comparable to results obtained with Leica R glass? My main interest is in the telephoto range performance, because I have excellent M-lenses in the 21mm to 90mm range. I would be using the longer range lenses mostly for landscape/seascape photos and occasionally for environmental portraits. Magic of Light Television: "What is Sharpness in Photography?" I started a television channel on photography, "Magic of Light". Two broadcasts a week, every Saturday and Thursday 7 PM Pacific Time). The new episode, "What is Sharpness in Photography?" is up now! Enjoy! Any reason to own two lenses of the same focal length? Hey everyone, Looking for a bit of friendly advice and opinion. I currently have a Leica M-A and like to stick to the "One Camera, One Lens" method of keeping my work consistent and always improving. When people talk about this, one lens usually refers to focal length, not exactly one lens. After lots of trial and error I learned that I see in 50mm, so I prefer using that focal length for all of my shooting. However, I currently own a 50mm Summicron-M and a 50mm Elmar-M (both newest versions, both brass chrome). I can't decide if I should sell one, and if so which one, or keep both. The summicron is quite a bit heavier than the Elmar, although I wouldn't classify either as light since they are both the chrome versions. The Elmar obviously have a size advantage, but the annoyance of uneven aperture settings and the collapsible function can sometimes get annoying as it doesn't lock collapsed and can just slide out if positioned in such a way. I'm having a hard time deciding if it makes sense to keep both, and if not, which one to keep. I currently justify ownership of both by saying the Elmar, while limited, is more suitable for when I'm not out specifically to be shooting, but walking to work or just running errands. The smaller size is nice when I'm not focused specifically on shooting. I'll use the Summicron when I'm going out to shoot, as its usability is substantially better, at the cost of its size and weight, but when I'm shooting the camera is in my hand and not really packed away or even hanging from my neck. Let me know your thoughts everyone, interested to hear some opinions on the subject of owning multiple lenses of the same focal length. Thank you! Renting Leica lenses in Tokyo? I may be going to Tokyo some time next year. I'd like to know what my options would be as far as renting Leica equipment goes. Don't know where to start. Google search doesn't yield much. Any places that you know of? How easy is it to rent there? What are the requirements (if any)? Any input would be much appreciated. Ta in advance. Hello guys, Leica Lab Italy asked me some questions about the use of the 28mm lens in my Street Photography. If interested that is the link: http://www.walkingphotographer.net/blog/leica-lab-interview-28 bye ! M stuff - what to swap for a T system ... and what to keep?